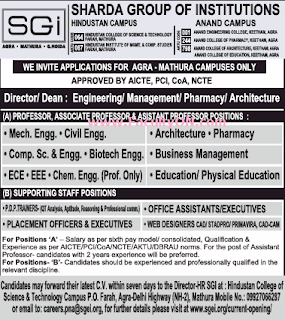 Sharda Group of Institutions, Agra has advertised in the Times of India newspaper for recruitment of Teaching Faculty- Director, Dean, Professors, Associate Professors, Assistant Professors, Supporting staff positions jobs vacancies. Interested and eligible job aspirants are requested to apply with in 7 days.Check out further more details below. About College: THE SHARDA EDUCATIONAL TRUST WAS FORMED AS AN EDUCATIONAL INITIATIVE IN RESPONSE TO THE EMERGING TRENDS, BY A GROUP OF LEADERS FROM INDUSTRY, TRADE, BUSINESS AND ACADEMIA WITH AN AFFIRMED OBJECTIVE OF PROVIDING “PROFESSIONAL EDUCATION TO MEET GLOBAL CHALLENGES”. 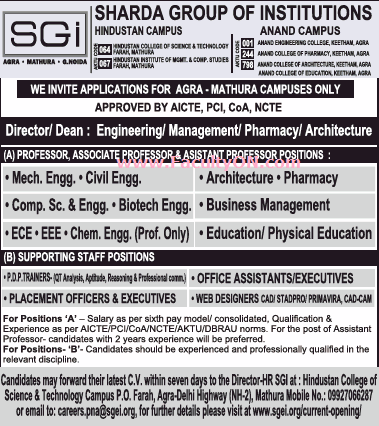 For the post of assistant professor - candidates with 2 years of experience will be preferred. For Positions B: Candidates should be experienced and professionally qualified in the relevant discipline. As per sixth pay norms. Reference: Recruitment Notification / Career Job Opportunities notice for Teaching Faculty -Professors, Associate Professor, Assistant Professors on Times of India newspaper Dated 4th July 2018.